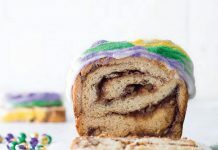 The arrival of Carnival Season on January 6 sends Louisianans running to their favorite bakeries for the king cakes they’ve been dreaming of since the previous Mardi Gras. Whether traditional or filled with unexpected ingredients, there are countless varieties to satisfy your sweet tooth. During Carnival, Cochon Butcher in New Orleans pays tribute to a king not typically linked to Mardi Gras: the king of rock ‘n’ roll himself, Elvis Presley. With his birthday falling on January 8, just two days after the Epiphany, it’s fitting that the Warehouse District restaurant lets the good times rock and roll with an Elvis King Cake. At Butcher, Link Restaurant Group Executive Pastry Chef Maggie Scales jazzes up traditional cinnamon roll-style dough with a banana and peanut butter filling. The king cake is topped with toasted marshmallow, Mardi Gras-colored sprinkles, and candied bacon. Finally, since Butcher is all about pork, a pig trinket replaces the standard king cake baby. 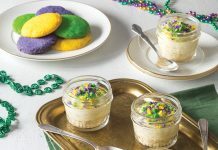 Maggie also suggests putting your own spin on the king cake by adding different ingredients to the filling, such as pecans or coconut. “New Orleans has a traditional filling, but I think it’s always cool to put new stuff in there,” she says. Spray a large bowl with cooking spray. Place dough in bowl, turning to grease top. Cover with plastic wrap, and let stand in a warm, draft-free place (75°) until doubled in size, about 2 hours. Divide proofed or chilled dough into 2 pieces. Use remaining 1 cup flour to dust dough, work surface, and rolling pin. Roll each piece into an 8x10-inch rectangle. Spread each strip with a layer of Peanut Butter and Banana Filling. Using a serrated knife, cut each strip in half lengthwise, and carefully roll each strip into a rope. Twist 2 ropes together end over end. Repeat with remaining 2 ropes. Bring twists together, sealing ends and forming a circle. Place on a baking sheet lined with parchment paper, and cover with a tea towel. Let rise in a warm, draft-free place (75°) until doubled in size, about 1½ hours. Bake until light brown, 25 to 30 minutes. Let stand on a wire rack until cool. In a medium bowl, toss together bacon and brown sugar. Transfer to a rimmed baking sheet. Bake until sugar is melted, 8 to 10 minutes. Turn out bacon onto paper towels to let drain and cool. In a small bowl, stir together ¼ cup cold water and gelatin; let stand until soft, 5 to 10 minutes. Melt over a hot water bath or in microwave, heating 15 seconds at a time. Set aside. In a small saucepan, cook remaining ¼ cup water, remaining 1 cup granulated sugar, and corn syrup over medium heat until a candy thermometer registers 242°. Remove from heat, and let sugar mixture cool until a candy thermometer registers 210°. Pour into the bowl of a stand mixer fitted with the whisk attachment, and beat at medium-high speed until foamy. Add gelatin mixture, and beat at high speed until light, fluffy, and cool to the touch, 6 to 8 minutes. Using a spatula, spread marshmallow topping onto king cake. Using a kitchen torch, brown topping until golden. Sprinkle with Mardi Gras sprinkles or colored sugars. 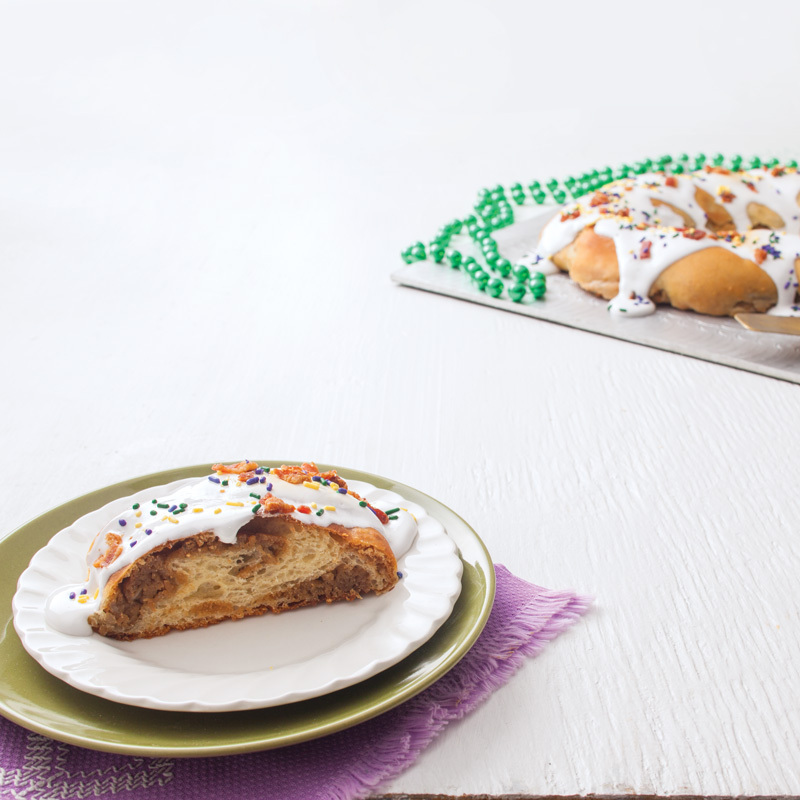 If desired, finish by lifting the king cake and hiding the king cake baby under a random portion of dough. Top with candied bacon. *We used Lesaffre Saf-Instant Yeast, which does not need to be dissolved. Note: To make dough ahead, in Step 2, dough may be pressed into a lightly oiled rimmed baking sheet, and covered with plastic wrap. Chill at least 2 hours or overnight. Proceed with the recipe as-written, except the chilled dough will need additional rising time in Step 5 (up to 1½ hours more, not more than 3 hours total). Place bananas on a rimmed baking sheet, and sprinkle with brown sugar. Bake for 20 minutes. Let cool. In a medium saucepan, combine ¾ cup milk and 2 tablespoons granulated sugar. Bring to a boil over medium heat, stirring until sugar is dissolved. 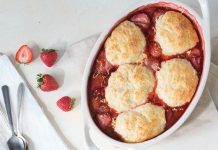 In a medium bowl, combine cornstarch and remaining 2 tablespoons granulated sugar. Whisk in remaining ¼ cup milk. Add yolks and vanilla, stirring until smooth. Temper egg mixture by whisking in about one-third of hot milk mixture. Return egg mixture to remaining hot milk in saucepan. Cook, whisking vigorously, until mixture comes to a boil. Pour pastry cream into a bowl, and press a sheet of plastic wrap directly onto surface of cream. Refrigerate for at least 4 hours or overnight. In the bowl of a stand mixer fitted with the paddle attachment, beat bananas at medium speed until broken up but still chunky. Add cream mixture and peanut butter, and beat until combined. If preparing a day ahead, cover with plastic wrap and refrigerate.